Saudi Arabia has recently announced decisions allowing women to apply for jobs in air traffic control, the traffic police, and the military, and to positions as investigators at the public prosecutor’s office. These decisions are made in line with Saudi Vision 2030, to increase women’s participation in the workforce from 22 to 30 percent. Such changes will transform Saudi society, where employment is dominated by men and guardianship laws are still prevalent. Bahrain, Oman, and the United Arab Emirates were the first Gulf Arab states to establish police training institutes for women and integrate women into police forces. In these countries, there was a push from the states’ leadership for women’s inclusion in police forces, due to gender segregation and local laws that prohibit physical inspection of women by male police officers. As a result, police women started working in women’s jails, schools, customs, and border patrols as early as the 1960s. 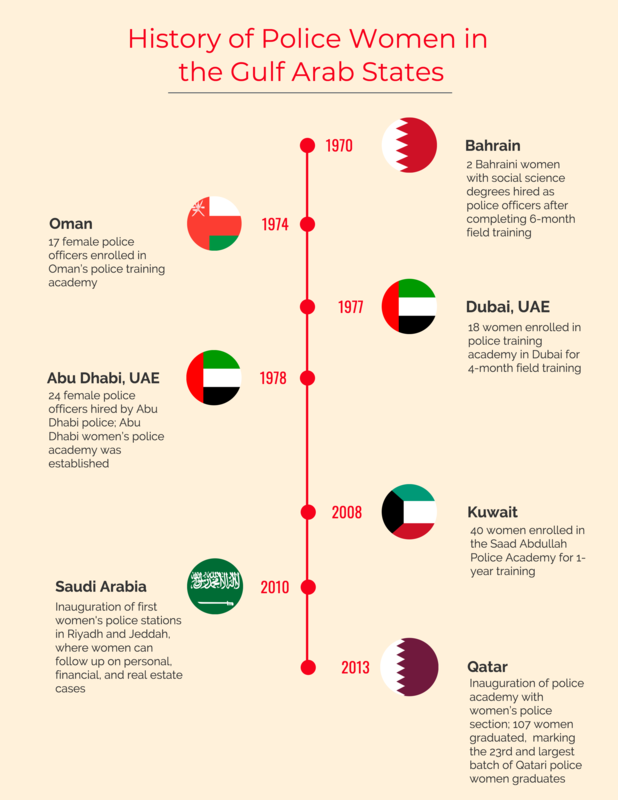 By the 1970s, Gulf Arab states established specialized police academies for training women. Although women were allowed to join the police forces, it was considered as compliance to leadership orders and wasn’t widely accepted in society. Women in Gulf police forces face many challenges working in patriarchal and conservative societies. Generally, women working in front-line police roles is considered inappropriate, as it might put women in dangerous situations. In 2008, women were allowed to join the police forces in Kuwait, though initially only unmarried women were allowed to apply to the police training academy. Married women have since been allowed to apply as well. The decision allowing women to join the police forces in Kuwait caused controversy in the Kuwaiti Parliament. Two Islamist members of parliament condemned the minister of interior’s efforts to increase the number of women in the police, believing having female officers conflicts with sharia values and stressing that women working in police departments should only hold administrative jobs. Moreover, women’s integration in police forces has remained primarily restricted to gender segregated roles. Generally, women police officers deal with women victims or offenders only and there is little integration between female and male officers in the workplace. A survey of female officers in the Dubai Police shows 60 percent of surveyed female officers agree that policewomen should perform exactly the same duties as policemen. Yet, when they were asked whether policewomen should perform specialized duties, 81 percent favor specialized duties, in which female police officers would primarily handle women’s and children’s cases. The same survey shows that female officers with more education and work experience tend to embrace gender integration at work and are more likely to prefer having the same assignments as male officers and have higher appreciation for women’s work in the police. Female police officers in the Gulf Arab states have had an influential role in forwarding changes to accommodate women in their profession based on their personal needs as well as religious and cultural values. In Bahrain, the female police uniform was designed based on the United Kingdom’s female police officers’ uniform, where the required head cover is a hat. Bahraini female police officers who observe hijab were discouraged from wearing it, as it was not part of their uniforms. In 2003, 135 policewomen signed a petition to allow them to wear the hijab, feeling it is a crucial part of their Islamic belief and Arab identity. The petition was approved by the Parliament and a green headscarf to match the uniform was made available. The Dubai Police has also worked to create a more welcome environment for women police officers. As police uniforms are mainly designed by men, women have had to suffer with uncomfortable uniforms that don’t suit their bodies. After receiving feedback from women police officers, the Dubai Police designed uniforms for female police officers to make them more comfortable. Additionally, as police women have the same concerns regarding maternity leave and child care as women working in other fields, the Dubai Police established child care centers at work and internal regulations have been passed permitting flexible hours for breastfeeding mothers. This has helped the Dubai Police to attract more women to join the police force and reduce absences or work delays due to child-care needs. While in some Gulf Arab states the role of women in the police has remained limited, others have allowed women to work as human trafficking investigators, dog handlers, forensic experts, and medical doctors, and to join the VIP protection unit. Part of Dubai Police efforts to integrate women into the police force is sending women abroad to specialize in cybersecurity, digital crime, DNA and fingerprint testing on weapons and machinery, forensic chemistry and toxicology, document examination, forensic medicine, and radiology. These specialties could provide options for women who want to pursue careers in the police force that are more specialized and less physically challenging. A recent trend in Gulf Arab states’ police women empowerment is celebrating the achievements of women in police. The media has played an important role in empowering women and showcasing role models for young women and girls. In Oman, Lieutenant Colonel Shaikhah Bint Ashour Al Hambasiyah made local and regional headlines as the first woman to head a police station in Oman; Lieutenant Khulood Anbar also made the news as the first Qatari woman trainer at the women’s police academy in Qatar; and Lujain Alrasheed was recognized as the first forensic doctor and first woman to hold a major rank among Kuwaiti women police. Despite these gains, women will likely meet new challenges as police forces employ advanced technology. With recent robotics and artificial intelligence advancements by police forces, women, and men, will likely have to compete with robot police. In a statement by a director general of the Smart Services Department at the Dubai Police, he mentioned that “Robocop” doesn’t require leave, sick leave, or maternity leave. Robocop is targeted to replace 25 percent of the Dubai Police patrolling force by 2030. Other than Bahrain and the UAE, there is lack of research about women working in police forces in the Middle East, especially in light of gender segregation and social norms on the role of women in society. Bahraini and Emirati police women have played a vital role in empowering women in police forces in the region. Bahraini police women trained the first batch of police women in Kuwait in 2008 and helped established the police women unit in Kuwait. The Emirates Women Police Association held a global conference for police women in Abu Dhabi to highlight the achievements of women in police and share best practices from around the world. Looking at the history of women in police in the region, cultural and social barriers have started to fade in the past decade because of the economic recession in the region. The shift in the workforce and labor market will likely provide more options for women to participate in the economy. However, the real challenge remains providing a sustainable and sufficient number of jobs for everyone. The Saudi National Transformation Program: What’s in It for Women?